The fall wanes to winter and the weather turns cold, the sky darkens early, but the streets of my hometown are still warm and bright. I have lauded Frederick, Maryland before as a Norman Rockwell scene come to life and it lives up to that description even more than usual this time of year. The trees along Market Street are decorated with white lights, a sure sign the holiday season is underway. 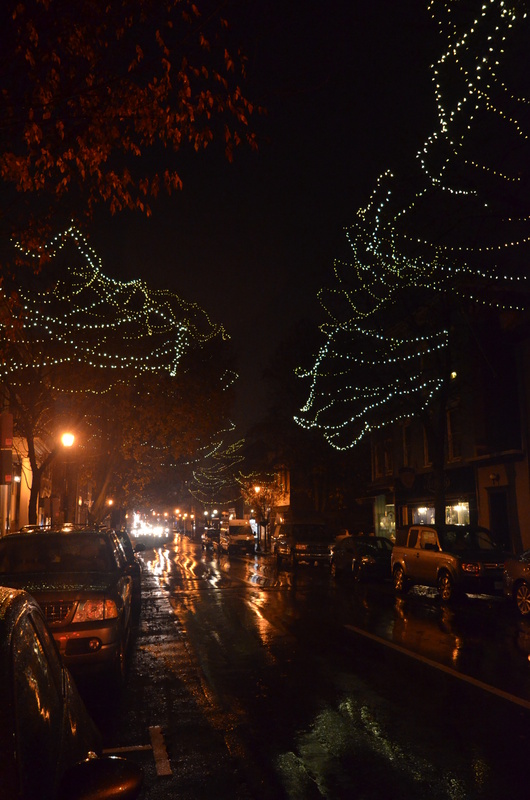 The main street, Market Street, basks in the warm yellow glow of tree after tree strung with lights. The many downtown businesses have not forgotten the art of the window displays either, enticing every passer by to stop and search their festively decorated stores. The shopping isn’t the only attraction in the city, festive Frederick has events throughout the season. You don’t just go to the mall to visit Santa; you can climb aboard the Santa Trains on the Walkersville Southern Railroad, running out of Walkersville just north of Frederick City. The jolly old elf will visit each passenger and pose for pictures as you roll through the countryside. Passengers are treated to hot chocolate and cookies upon their return to the station after an hour ride. You can climb aboard December 8th, 14th, 15th, 20th and 21st. You may be tempted to follow “a star, a star shining in the night” and thanks to the planetarium you’ll know what to look for. The Mystery of the Christmas Star show at Frederick County Public Schools’ Earth Space Science Lab sets out to explain the science and most likely explanation of the star the wise men followed to Bethlehem and the baby Jesus more than 2000 years ago. The star might even lead you to a doorstep or two as you spend an evening getting to know the Historic Homes of Frederick. The private residences open their doors to visitors for self guided tours of these decorated dwellings, many of which have rich histories that date back to the 1700s and 1800s. Since the tour is this weekend (December 7-8), you’ve probably missed it this year, but it’s a good one to put on next year’s holiday schedule. The season isn’t the season without Saint Nick, so join the Kris Kringle procession December 13th as the city celebrates the lighting of its tree. The city has strong ties to its German roots and shows it off with a parade through both yesteryear and downtown with German folk characters, including Kris Kringle. The parade goes down through the village until it reaches the city band shell in Baker Park to light the tree. The clustered spires of Frederick (mentioned by 19th century poet John Greenleaf Whitter in his poem about local legend Barbara Frietchie) also open their doors the evening of December 26th. I have been in many of the churches and synagogues included on the Candlelight Tour of Historic Houses of Worship; they are beautiful in the daytime and get only more ethereal by candlelight. Wherever you may find yourself this holiday season, take a moment to enjoy the sights, sounds, smells — and even the chill in the air. January will be here before we know it.